Pennsylvania’s best wrestlers once again travelled to Virginia Beach to take part in the NHSCA High School Nationals. 2019 was the 30th Annual for the NHSCA and Pennsylvania had success in all six levels. In the NHSCA Freshman Nationals Pennsylvania finished in third with 219 points. The Keystone State crowned one champion and earned seven overall medalists. Kiski Area rookie Enzo Morlacci (pictured) won the 152 pound title over fellow Pennsylvania wrestler Nolan Lear (Benton) in the finals 3-2. 2019 PIAA State medalist Cole Homet (Waynesburg) was third at 120 pounds while National Prep medalists Nicholas Feldman (Malvern Prep) took second at 170 pounds. Pennsylvania finished third in the NHSCA Sophomore Nationals with 241.5 points earning two Champions and fifteen overall medalists. Northampton sophomore Jagger Condomitti, a 2019 PIAA State medalist, was the 145 pound Champion while another District 11 wrestler, Lenny Pinto (Stroudsburg), won the 170 pound title. 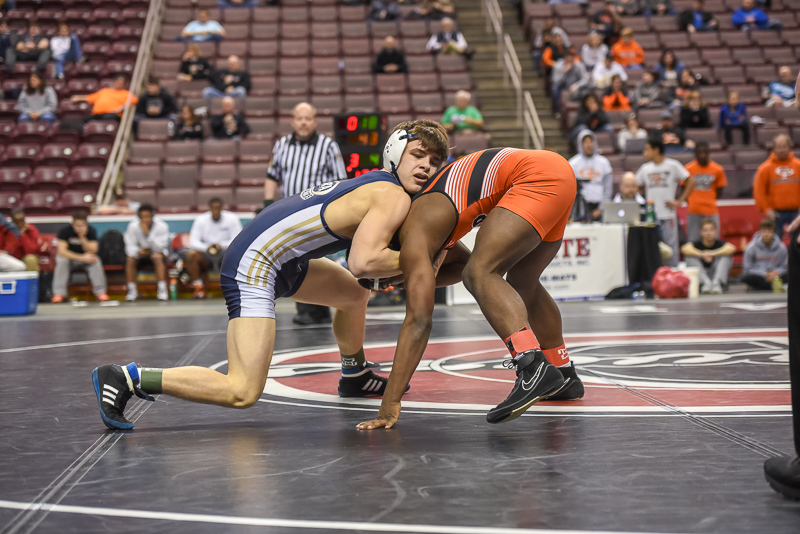 A pair of WPIAL sophomores finished third and fourth at 152 pounds with 2019 PIAA State qualifier Luca Augustine (Waynesburg) defeating 2018 PIAA State medalist Cole Spencer (Pine-Richland) in tiebreaker 6-2. Pennsylvania’s highest team finish came in the Junior Nationals with 219.5 points where they took second. The lone Champion came at 160 pounds where Tyler Stoltzfus (St. Joesph’s Catholic) defeated Gettysburg’s Dylan Reinert 7-4 in a battle of 2019 PIAA State Medalists. They were joined by Pennsylvania wrestlers Dillon Sheehy (Council Rock North) and Aurelius Dunbar (Mercersburg Academy) on the medal stand at 160 pounds. In the Senior Nationals Pennsylvania finished with 121.5 points landing them in tenth place. There were five overall medalists in the Senior Nationals including Gabe Miller (Pequea Valley) who won the 145 pound bracket picking up a 10-0 major decision in the finals over Colorado’s Anthony Ulaszek. 2-time PIAA State Champion Edmond Ruth (Susquehanna Township) was fourth at 170 pounds. One of the more impressive performances of the 2019 NHSCA Nationals came in the Girls Nationals as Pennsylvania took third with 71 points. They Keystone State had three medalists with senior Tatyana Ortiz (Mariana Bracetti Academy) finishing third at 103 pounds. Gettysburg teammates Montana DeLawder and Alexis Reinert took first and fourth respectively. DeLawder, a 2-time Regional Qualifier, won the 112 pound title with a fall in the finals. During the Middle School Nationals Pennsylvania finished with 190.5 points, good enough for sixth place, with thirteen overall medalists including two Champions, Ethan Rivera (Pocono Mountain) at 85 pounds and Hayden Cunningham (State College) at 95 pounds. Final results and brackets can be found on the Flo Arena.